Our Junior Associate Editor Dr. Jason Zaremski — well known to readers of this blog for his recurring journal club posts — was among several of the CJSM Editorial Board down in Houston recently for the annual meeting of the American Medical Society for Sports Medicine. Dr. Zaremski is a newly-elected member of the AMSSM Board of Directors as well as a member of the CJSM Editorial Board, and so he is uniquely qualified to give his fresh perspective on some the highlights of the meeting. Have at it Dr. Z! The 28th Annual American Medical Society for Sports Medicine Annual Meeting just ended and it was a wonderful assembly of sports medicine physicians from the United States and around the world, all gathering in Houston April 12 – 17. A wonderful addition to the conference this year was the Youth Early Sport Specialization (YESSS!) Summit, the exercise physiology pre-conference, and first Regenerative Medicine Symposium. The YESSS summit was a full day designed to review the current scientific knowledge related to youth sport specialization and develop a research roadmap to drive future research efforts based on existing evidence and knowledge gaps. Kudos to the AMSSM Leadership of the Summit, Jim Griffith, Stephanie Kliethermes, Col. Anthony Beutler and Drs. Daniel Herman, Neeru Jayanthi, and Steve Marshall. The Regenerative medicine summit, led by Dr Ken Mautner, provided evidence based research presentations on all aspects of this type of treatment modality. The highlight of the first dull day of the conference on Saturday had to be Dr Jeffrey Tanji addressing the Larry Nassar revelations and Jordyn Wieber and her emotionally moving talk. AMSSMs members provided standing ovations for both of these powerful talks. Sunday brought a return of the 5K fun run with nearly 200 participants and wonderful talks revolving around American Football, technological leaps in sports medicine, and many other topics, including the Hough memorial Talk by Dr Kim Harmon on Concussion Updates. Monday, after a great day of learning including research podium presentations, and a powerful talk from Brian Fletcher on perspectives on thriving after childhood cancer, the AMSSM Foundation Party at the NASA Johnson Space Center commenced. We hopped in buses for the 30-40 minute drive and arrived for an evening of fun! Tuesday brought the Sports Medicine Fellowship Fair and continued great talks, including a special session on Aerospace Medicine with the Presidential Keynote provided by aerospace medicine physician Dr Michael Berry! There were 2 more fantastic sessions in Wednesday, including one by Lisa Fenn Mahooti highlighting the importance of community change with a direct personal involvement. Special mention of Dr Jason Matusak and his planning committee for an outstanding 2019 annual meeting. We can’t wait for 2020 in Atlanta April 24th-29th! Regarding #AMSSM2020 (or will it be #AMSSM20 ?) — Dr. Zaremski is the chair of the planning committee for this event, and we’re sure Atlanta will be another in a long-line of excellent AMSSM conferences. 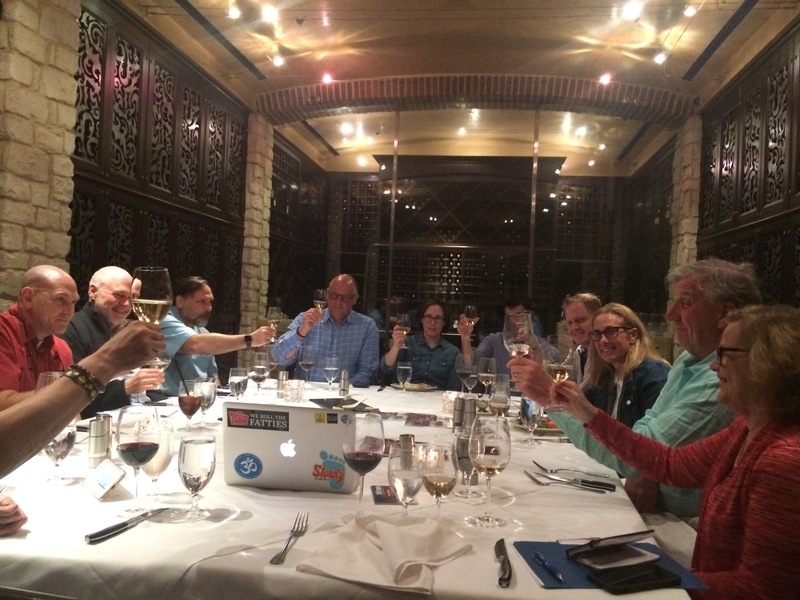 2019 we gathered on the Tuesday evening for a couple of hours of food, drink, and thought over how to make CJSM a better resource for our readers. The fruits of this meeting will be seen in future offerings we have coming your way!!! In the meantime, please accept your virtual champagne toast to you, our readers around the globe! The 2019 annual meeting of the American Medical Society for Sports Medicine (AMSSM) commences in Houston April 12 and ends April 17. Like many of hundreds of sport and exercise medicine (SEM) specialists around the world we’ve been looking forward to the event for months. This meeting represents one of the high points in our field of SEM, a venue for sharing much of the most current, relevant, evidence-based information in our field. And, as for most such meetings of a medical society, it also represents something of a shareholder meeting for AMSSM members (I happen to be one, as are many of the members of CJSM’s editorial board): it’s a time for the society to gather and, perhaps change bylaws, discuss finances, introduce new executive and board members, and say good-bye and thank you to the service given by those individuals who are stepping down from such posts. One of those individuals in any society is the president, the head dude/dudette. We have traditionally touched bases with the outgoing AMSSM president prior to the annual meeting, and this year we had the chance to catch up with Chad Asplund MD, MPH on the ‘year that was’ for AMSSM. 1. CJSM: We have to begin by asking you about your year as President of the AMSSM. What were your major challenges this year? What were your high points? Dr. Asplund (CA): The high points of the year were the finalization of the marketing and branding strategy with a new logo, member seal and messaging. It was also great to meet and to hear from so many of our members throughout the year. It was a humbling, but rewarding term as president and I am honored to have been selected. There were no major challenges, other than media requests regarding the USA Gymnastics (Larry Nassar) and Ohio State (Richard Strauss) cases and the Maryland incident involving the death of Jordan McNair. Youth sports is of special interest to me — I practice pediatric sports medicine at Nationwide Children’s Hospital, and perhaps 90% or more of the patients I see regularly participate in youth sports. The topic is of great interest to this journal as well: for example, CJSM will publish later this year a themed issue on topics in youth sports medicine, guest edited by my friend and colleague, pediatrician Alison Brooks M.D. of the American Medical Society for Sports Medicine (AMSSM). Youth sports has long been recognized as a valuable activity for the individuals and families who choose to participate. An abundance of evidence points to the health benefits — physical, mental, academic — that can be achieved by children and adolescents engaging in sports. There has been growing concern over the last decade or two (or three), however, of the potential and possibly growing risks of youth sports. The concerns range from early youth sports specialization and overuse injuries to early professionalism. The concerns include the youth sports culture itself – a culture manifest in nightmare form by the myriad incidents of abuse seen in USA Gymnastics or Swimming. On April 12 2019, the AMSSM will be hosting a pre-conference prior to their annual meeting, entitled the Youth Early Sports Specialization Summit (YESSS!) Among many of the subjects up for discussion is the “Healthy Sport Index (HSI),” an instrument developed by the Aspen Institute’s Project Play initiative and made public in October 2018. The HSI was designed to help kids and families answer the important question: what sport is right for my child? As a physician caring for thousands of these athletes a year, I can’t tell you how often I’m posed that question. Now there is a tool to help. One of the physicians who served on the Advisory Group for the development of the HSI was Michele LaBotz, M.D. She is a pediatrician and sports medicine physician in a large multi-specialty group in southern Maine, who serves on the American Academy of Pediatrics’ Council on Sports Medicine and Fitness (COSMF) and is a member of the AMSSM. She kindly volunteered to give an overview on the HSI for the CJSM blog, and we’re delighted we can share her thoughts in the run up to YESSS! Filed under Safeguarding in Sport, Youth Sport Tagged with #ProjectPlay, AMSSM, Aspen Institute, HSI, YESSS!